Think budget and investigate options – natural stone Vs composite stone Vs laminate Vs solid acrylic. Composite stone will not always be cheaper than natural stone, but it may require less maintenance. There are advantages and disadvantages with all materials, so get advice and investigate all the options. Timber is an option – sustainable & natural, timber benchtops can look fabulous, however they do require maintenance (sanding and oiling). The aging of timber from use, with natural indentations, grooves and colour variations can be really appealing to some and suits many homes. Cook’s kitchen? Durability and functionality is key. A porous natural stone like Calcutta marble is great in a show kitchen but not a cook’s kitchen. It stains and marks easily. Granite or Caeserstone would be better options. Create contrast with the splashback – unless you want the same material running from the bench up the wall, in which case you’ll need to ensure the material chosen can also be used as a cladding. 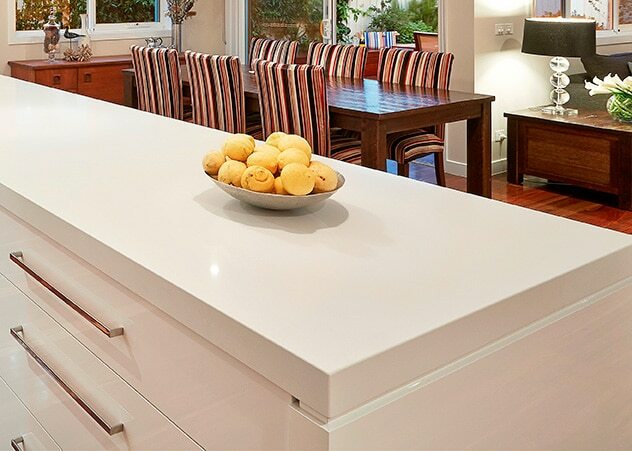 The thinner the better – gone are the days of 40, 60 & 80mm benchtops with thick waterfall edges. The latest trends from Europe are super thin. Go as thin as the material you’ve selected will allow.